Low code promises to radically improve the development speed of web and mobile apps. But how useful is that for Enterprises that require true enterprise grade applications? 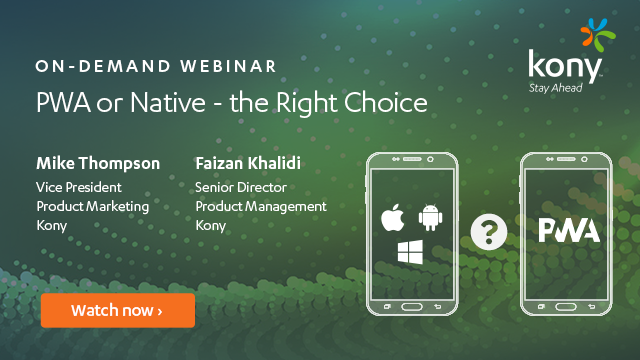 Kony has optimized its platform to deliver low code capabilities but still enable enterprise grade user experiences, complex business logic, high-performance, high volume backend system integration and security. This approach lets you get the power of low code and automation without hitting a wall when you need an enterprise grade app. The presentation will dig deeper into the tooling and architecture required to make this a reality. Join our webinar with guest speaker, Forrester VP & Principal Analyst, Brendan Witcher, for a discussion around supporting today’s top retail initiatives through apps. Brendan Witcher identifies what drives mobile customers to adopt and abandon brands, shows how data is becoming the new competitive weapon, reveals retails top five initiatives, addresses the future of commerce and outlines important steps for becoming a digital master. Join guests Peter Wannemacher, Forrester and Jim Marous, Owner and Publisher of the Digital Banking Report and Co-Publisher of The Financial Brand for a webinar where they share 5 things you can start doing today to accelerate your journey to digital transformation. For financial institutions in Europe 2018 will be a year of significant opportunity and the recent implementation of legislation will result in an increased importance on digital channels. We invite you to join our webinar with featured guest Jost Hopperman from Forrester who will share his latest insights on key technologies that will increase competitiveness, compliance, and revenue for the European banking market. PSD2 is finally here and 2018 is turning out to be a big year for the banking industry as financial institutions open their API’s and make them available to third party providers. Join Kony and Gemalto for a discussion around the implications of PSD2 for the banking industry. Customer expectations and demand will continue to drive digital innovation in retail banking in 2018. Gain insights from featured guest Jim Marous, Owner and Publisher, The Financial Brand, to find out how advancements in Fintech will impact Retail Banking in 2018. Find out what you can expect and how you can take advantage of future-focused opportunities for success. Digital is completely changing the customer experience in the Retail space. With that in mind, we hosted Forrester Research and our partner Diebold Nixdorf to provide you with Forrester’s Top 5 Retail Predictions for 2018. In the webinar, our guest speaker Forrester Principal Analyst Brendan Miller provides some great insights into what to expect and how to prepare for 2018. In this on-demand webinar, we will provide, together with Chris Marsh, Research Director at 451 Research, a roadmap for how to get started successfully building apps at scale. As you are planning for the year ahead, make sure you watch this to make the most of your investment. We invite you to join our featured guest and Fintech influencer Jim Marous from the Financial Brand along with Kony CTO, Bill Bodin to learn more about Artificial Intelligence and how it will affect retail banking now and in the future.